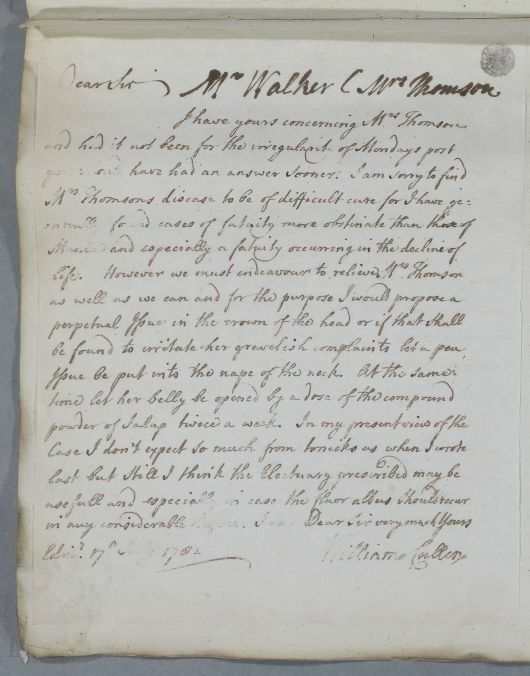 Reply to Mr Walker concerning the continuing case of Mrs Thomson, who suffers from 'fatuity' connected to her old age. Cullen recommends a perpetual issue in the crown of her head or the nape of her neck. There is 1 image for this document. Summary Reply to Mr Walker concerning the continuing case of Mrs Thomson, who suffers from 'fatuity' connected to her old age. Cullen recommends a perpetual issue in the crown of her head or the nape of her neck. Case of Mrs Thomson whose symptoms are attributed to the 'fatuity' of old age.